I'm stoked to be building up a Ross Lillistone First Mate for Bike Sailing. Bike sailing is the art of towing one's sailboat to and from the water by bike instead of car or truck. I've been bike sailing with smaller craft (a 12' inflatable kayak with a Sailboats To Go sailing rig, and a 13' Banshee). Bike sailing opens up really fun round trip and journey missions where you put in and take out at different places. I live in San Francisco and my sis lives in Berkeley. Recently I was able to sail to dinner at her house! The bike is a folding bike that fits in the boat when I sail. The trailer is lightweight and also stows aboard. My first two attempts have been fun enough (and sketchy enough!) to want to build a specific boat for my favorite type of sailing that is bigger and more seaworthy. I researched and chose a First Mate by Ross Lillistone, but asked Ross to scale it up a bit, because I'm hoping to sail with up to 3 passengers. One of the challenges of my build will be ensuring that the boat is not too flexy. 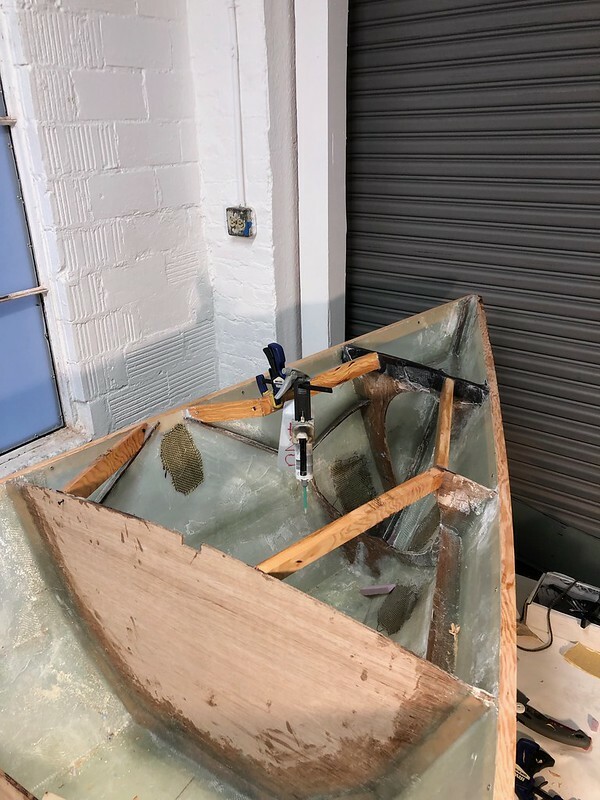 I've researched and tested about 10 different methods of stiffening G10, and am confident I can make a boat that's as light or lighter than if I'd used 1/4" plywood for the hull. I am interested in talking to anyone who has worked extensively with G10 and knows about UV stability and strength properties. Fascinating concept. I'm skeptical that you can make it lighter in G10 than in wood, but I do hope you are successful. Please keep us posted! Thin sheets are pretty bendy and G10 is a lot heavier than plywood. Thickness makes a huge difference in stiffness in bending. Comparing 3mm plywood to 1/16" G10, the thicker plywood panel is much stiffer for the same weight. I took some values from Matweb for generic plywood and G10, which is fairly accurate, but far from reliable for design. These numbers are good enough to compare stiffness properties. I think the tensile strength listed for G10 was too high, almost twice the minimum required. The numbers below are relative for the thickness given. For the same thickness, G10 is twice as stiff, 4 times heavier and 3-5 times stronger. Last edited by MN Dave; 03-13-2019 at 11:26 PM. With some wooden frames and gunwhales, your boat should be sufficiently stiff, if SOF boats are anything to go by. However, it will be heavier than a SOF. And hellish expensive! G10 is epoxy and glass, so it will need UV protection. Paint would be easiest. Dave I appreciate the strength table. I plan to do some twist tests on the hull to see how it stiffens up at different phases of the build (like before and after adding the side deck). To understand this stuff I've been playing with plastic clamshell food containers, twisting them in my hand with and without the lid, then cutting a hole in the lid (often on the line of the label) to then twist it with the equivalent of side decks. I've learned a lot about how flexible tubs behave and have some ideas for how to reinforce at key points. I don't think it'll be lighter than plywood, but hopefully it'll be the same. The material was free because it was leftover from a past project, sitting in the shop for the last 4 years. Robm, thanks about the paint tip. What about clear varnish, I love the greenish semi-translucency of the G10 and want to keep it if possible. 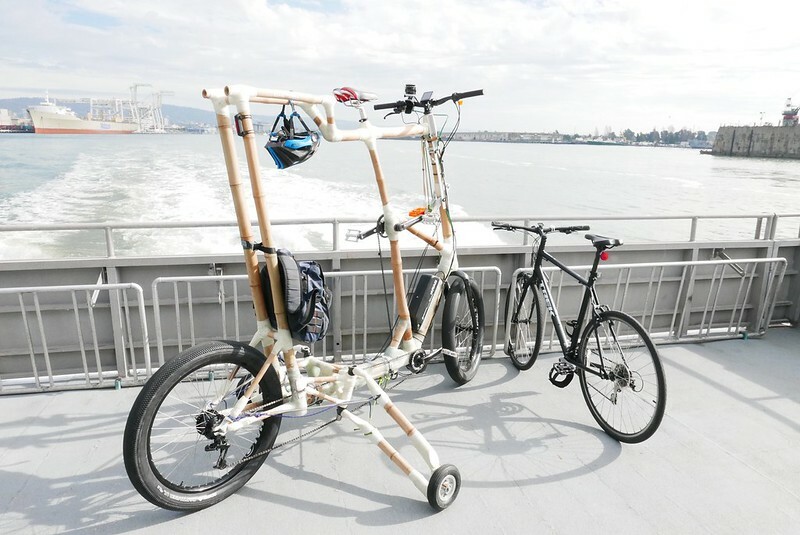 I've been sailing SF Bay and around Northern California for many years, and while I'm sure you can build a glued lap ply or SOF boat that can carry both your folding bike and trailer/dolly wheels, I'm concerned about sailing from SF to Berkeley and back -- particularly with three people, the bike and wheels. As you probably know, the prevailing onshore winds (West to East) can get up to 25-30 knots with gusts into the 40's during the summer, and small open boats can have a lot of trouble even going downwind, much less upwind. And God how I know this, having sailed two Blue Jay 14' boats out into the Bay and had a number of adventures -- even with a small outboard at times. I've also been towed back to the ramp by kind boaters several times, when the wind dies and oars can't beat the tides and currents. 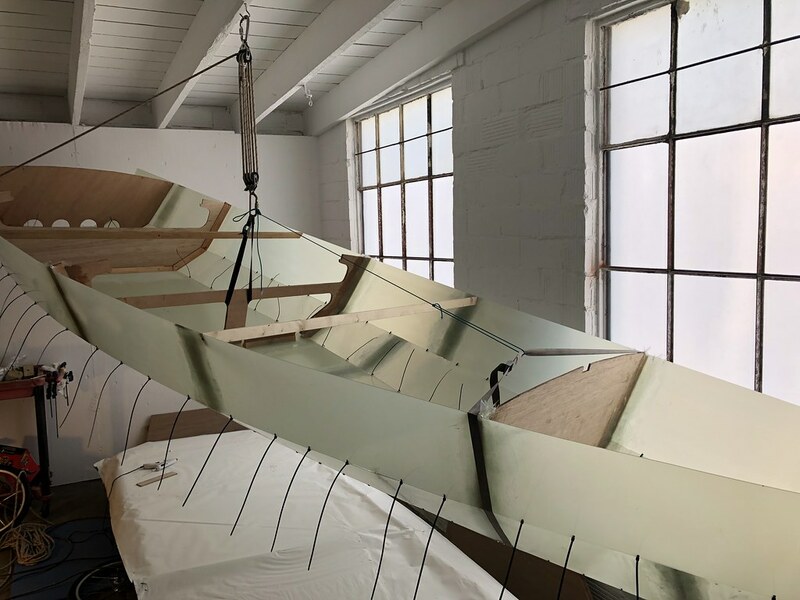 I'll suggest just building your FM in the lightest marine ply you can possibly use, and being very careful with the interior framing, seats, gunwales, spars, etc to make 'em as lightweight as possible. You might even be able to use lightweight redwood for thwarts and some other non-load-bearing parts. You'll certainly be able to tow it if you keep it under 100lbs. Then see how well it handles that SF-Berkeley run in various weather before you take more than one guest out for dinner. Thx Thorne, what about reefing? Isn't that the way to handle the gustier days? I've been out when it's big on my Banshee and gotten scared back to the dock. I tried reefing the Banshee but the result was sucky because the sail didn't have reef points. The rig I'm planning to use is the Balanced Lug that Lillistone recommends in the plans. It's reefable down to like 55 square feet, which should be good for a 17' boat, based on my experience. But open to what you have to say. On G10, you might want to look into automotive clear coat for UV protection. PU varnish should work too, but it's yellowish. The clear coat link might not be the best, but it gets the idea across. I would also look into the best brand of epoxy for G10. What we use here is designed for wood. I posted information on flat panels. 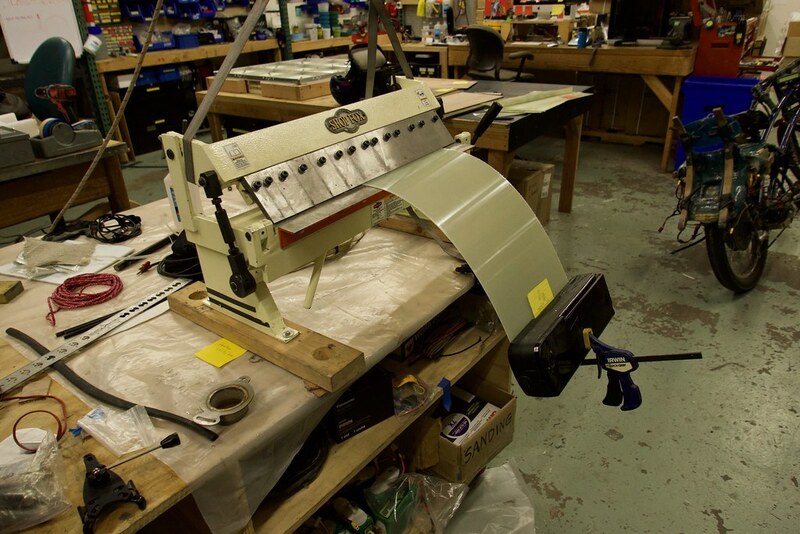 Once you start bending and bonding to other bent panels, it gets a lot more complicated. Wide flat sheets of anything are much more flexible than curved panels. It might turn out better than those numbers. It sounds like you have a far more economical source of G10 than most of us. (Edit: If I had read#5 more carefully, this is left over material, so cost is not an issue) Otherwise, you would be better off with thin okoume, meranti or sapele. Once you are familiar with all three, you will see that my generic plywood properties are in the ballpark, but real plywoods are on different bases. Relative, not precise data. After reading this thread, you will see how, uhm, easy? it is to find marine okoume near you as well as how weird a simple request for information can get. Last edited by MN Dave; 03-21-2019 at 01:58 PM. I think 100 pounds is not realistic for this boat, that's less than my 13' Banshee. I am aiming for 200. Given this, I see little reason not to build in plywood according to the plans. 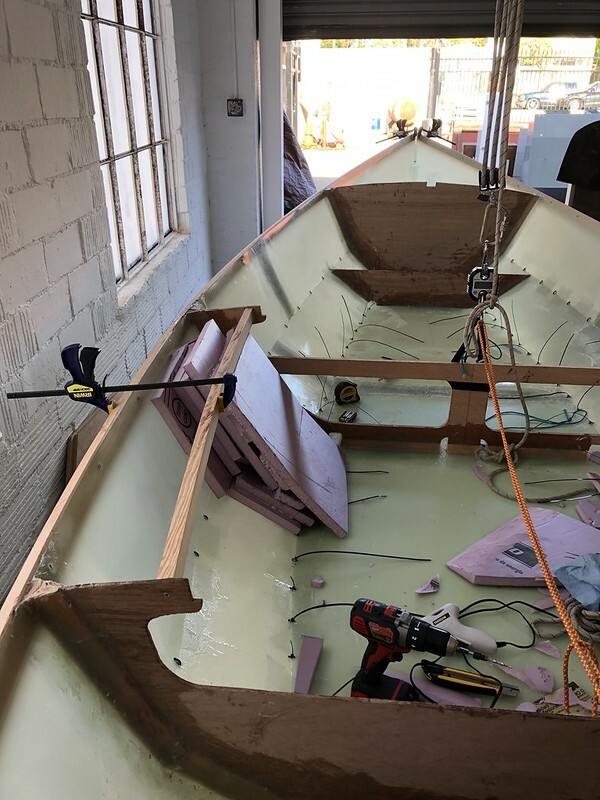 My brother's Phoenix III (same design but in glued lapstrake)--built out of heavy Baltic birch plywood--is well under 200 lbs for the empty boat. With the rig, you'd probably still be under 200. And you'd have a much better boat, I think. Then again, I'm not sure how much weight the increase in size will bring, so yours would weigh more. I'd much rather work with wood, I guess. Thx Thorne, what about reefing? Isn't that the way to handle the gustier days? Yes and no. Reef all you want, you're still in a small boat in big winds and big waves. There have been times in the Phoenix III when I've been reefed ALL the way down to a triangular lateen sail shape (maybe 35 sq ft?) and it's still too much sail. I heartily concur with my learned associate Tom. 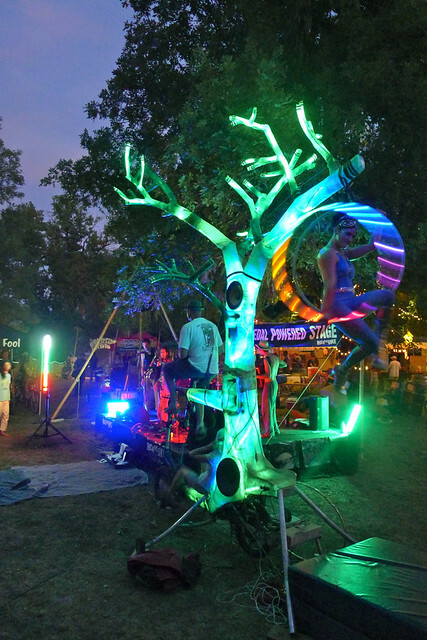 As as I said above, build it as light as possible and see how it works for bike trailering - should be fine. But the sailing experience may need to be gained firsthand - that’s certainly how I learned! And reefing won’t help much with bashing to windward. Keep us informed on your build progress. Thanks Thorne and Tom, I believe it about days when a reef isn't enough. I am a committed student of the Bay, with a couple dozen sailing days and counting. Normally I try to sail on the early side in the summer, to avoid the 3-5pm onslaught of west winds. But I also really want to try new family sailing adventures like having lunch in Sausalito, so I will endeavor to get more and more comfortable with the fresh winds and build up to carrying passengers and crossing the main channel to Sausalito. Even something more modest like sailing around Alcatraz would be huge for me. Another I'd love to do is camping on Angel Island. I will keep you all posted. I want to set up a weighing rig from the rafter and also set up a twist test today, having only glued the frames down so far. I want to be able to measure twist when it's still zip ties holding the hull panels together. 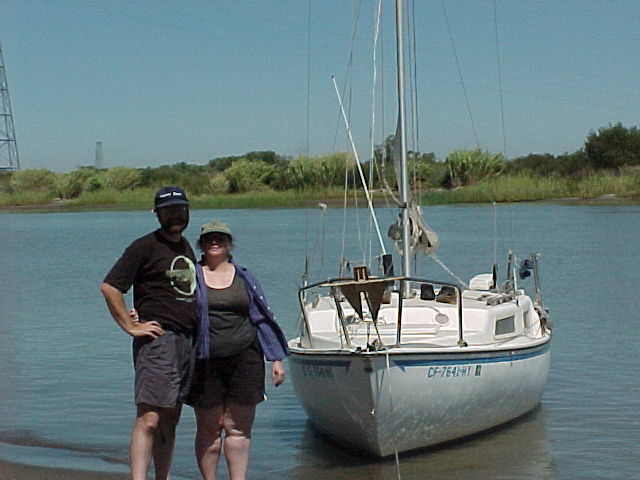 I sailed my San Juan 21 all over the Bay, Delta and Sierra lakes, as well as trailering her up to Anacortes and singlehanding up to Nainamo and back in the early 90s. Even a boat that size was often too small for the Bay in the summer, and I relied heavily on the 6ph longshaft outboard when the winds died and currents or tide pushed us the wrong direction. So sailing like you want to do is a lot of fun, and many Bay sailors do it -- but NONE of 'em do it in small open boats that can be towed by a bicycle. 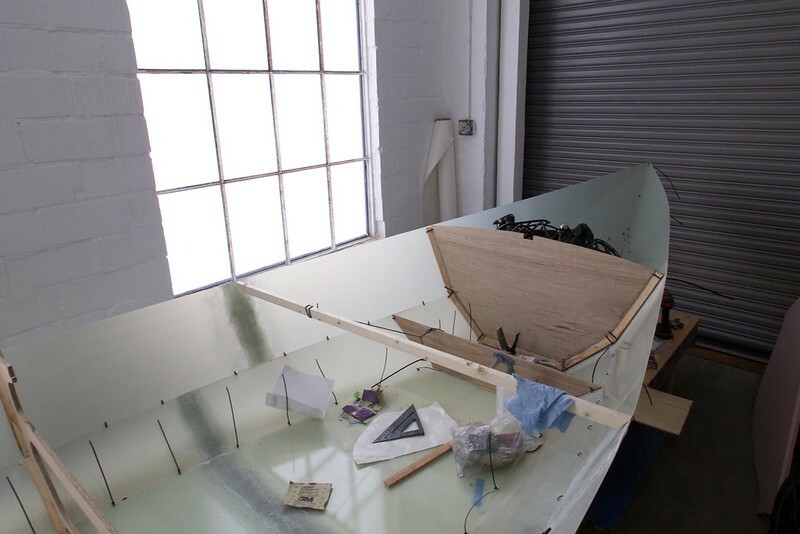 There are many good reasons for this (far too many to explain) so the best thing is for you to build whatever you want and then try sailing the Bay. Carry a cellphone in a drybag or better a waterproof marine radio, so if you get swamped or capsize you can get assistance. Last edited by Thorne; 03-14-2019 at 11:49 AM. Yep, learned. That is a nice way to say "already made a bunch of dumb mistakes, but muddled through and won't do that again." And reefing won’t help much with bashing to windward. Keep us informed on your build progress. Excellent point. As you reef, you lose a lot of length from the leading edge of the sail, making it less effective for windward work. 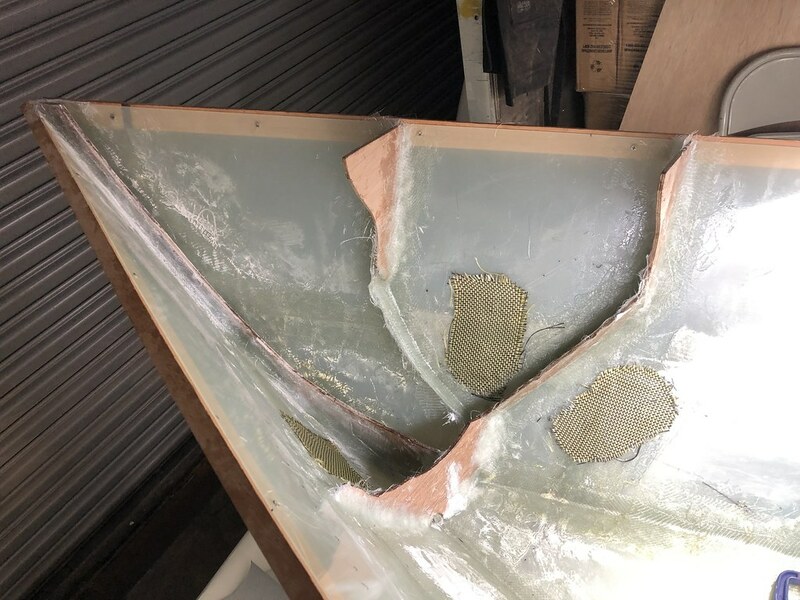 And of course you also lose the sail area needed to bash through the bigger waves, which make it difficult to tack as well. You can't reef for sea state. Eventually you just can't make much (any) good to windward in a small boat, so that does affect your choice of courses. Last edited by WI-Tom; 03-15-2019 at 02:38 AM. 1. Bike sailing is really cool. A few years back I wrote THIS COLUMN in Duckworks about circumnavigating Wisconsin by boat and bike combo. Down the Chippewa River (8 blocks from home) to the Mississippi, turn up the Rock River in Illinois, head upstream to the Wisconsin border, bike portage 35 miles to Lake Michigan, sail north to the UP of Michigan, bike portage 25 miles to Lake Superior, etc etc. A really neat idea, I understand the attraction of doing all this completely under your own power. I was thinking skin-on-frame for my trip. 3. When you make a radical and very experimental change to an established design like First Mate, well... Then you are attaching that designer's reputation to your experiment whether he wants it attached or not. People hear "First Mate" and think of Ross Lillistone. If your experiment is a complete success, that might be ok (or it might not; it might change people's perceptions of that designer as someone who is ok with building his designs in G10, when he might not want to, etc.). But if it fails... well, his reputation is attached anyway. Even if he had nothing to do with the project other than designing the boat you based it on. Now, you might be perfectly comfortable risking failure; I'd say that's fine. I myself tolerate more risk than other people might, and don't mind a certain amount of failure as long as I'm not putting others at risk, too. But a designer who sells plans for other people, complete strangers who trust him completely to know what he's doing--that designer has to think much more conservatively. He has to calculate a margin of safety that will protect people with less than perfect building techniques, or less than perfect sailing technique. And so I think good designers are probably incredibly thoughtful about every single detail in a boat they've drawn. They have to care because their reputation is at stake, and more importantly, ultimately the safety of their customers is at stake. So please consider: when you take risks with a design, the designer takes them right along with you, like it or not. So before I went ahead with a radical structural change like moving from plywood to G10, I would make sure the designer has given his 100% approval to the experiment. Otherwise, I think you are submitting that designer to an amount of risk he did not ask for, and may not appreciate. If he's not, then maybe the right thing to do would be to find a different design to do what you want. 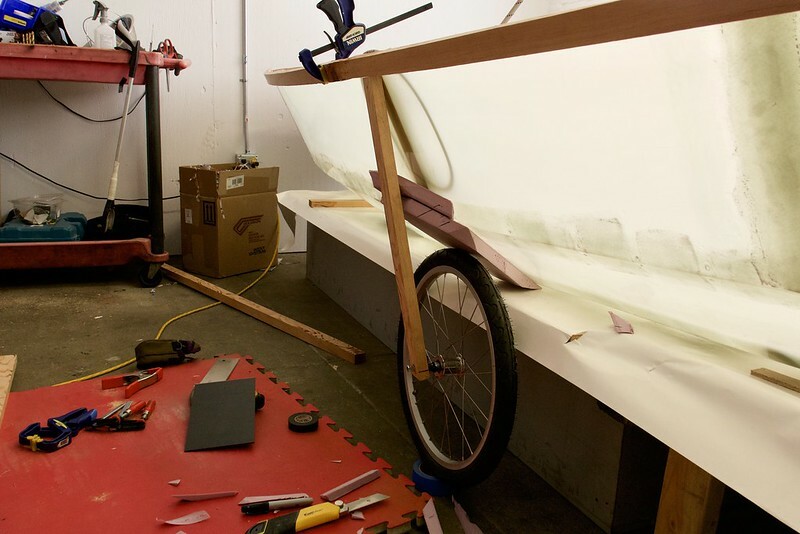 Not trying to discourage your plan for a bike sailing boat--I think that's a fabulous idea. But, having derived so much enjoyment from the work of the designers I know, I feel very protective of them. So, I encourage you to find out what Ross thinks if you haven't already, and make sure he's on board with what you're trying. Hopping down from my soapbox now. Good luck! Sounds great, go for it! 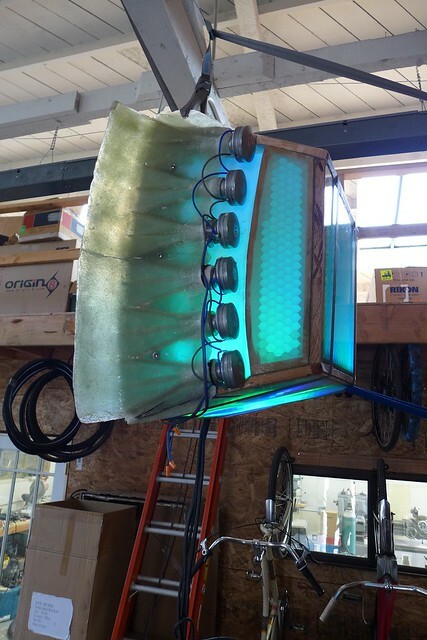 I only hope this project raises Ross' reputation because I've found him to be involved and supportive but also concerned and cautious, making sure I know to add foam flotation to account for the denser G10, for example. Looks like some fun projects, and I love the double-decker 'bent!!!! Best of luck with your build. Thanks for the reply. I'm glad you've discussed it with Ross. Do keep in mind that, if you're like me, enthusiasm for a project can get in the way of heeding advice you don't really want to hear. For me, it's not about whether YOU are comfortable with the risk--I strongly believe that should be your choice alone. It's whether the DESIGNER who is involved is comfortable. And designers have to tread a careful line with clients--their disapproval might sound like being "cautious and concerned" to an enthusiastic client excited about his own ideas. Remember, this project will be widely identified as "that guy who built a Ross Lillistone First Mate out of G10 and ________________." Last edited by WI-Tom; 03-16-2019 at 08:18 PM. Strong enough to lift from the Midships Web Frame for weighing. 120 pounds so far with no transom and only 4 frames glassed in. Enough different that you should just call it "inspried by Ross Lillistone's First Mate". Here's the latest on the build. 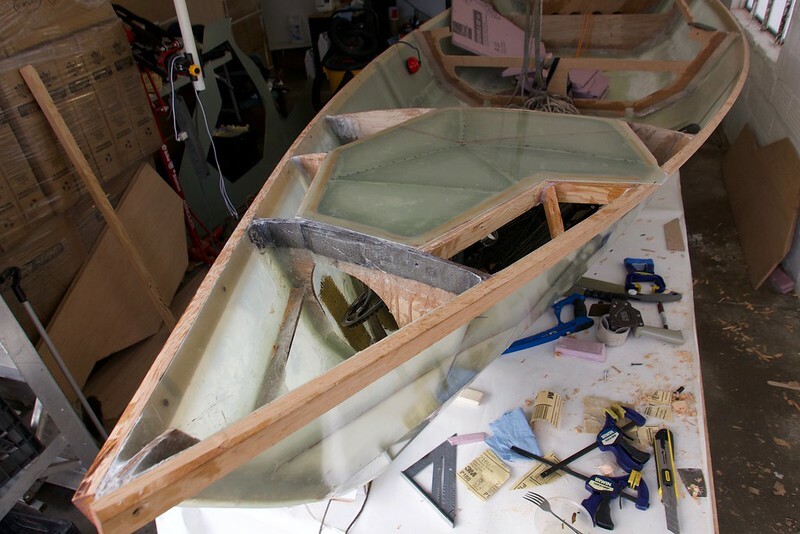 Weighs in at 122 pounds with the gunnels dry fitted (clamps off) and the transom locked in. No centerboard case or deck. How is that vs. plywood for this stage of my build? Personally I love the translucency. I am probably going to go against the wisdom of painting to keep the skin on frame look of the G10, which means clear coat or lots of varnish. Have started doing UV tests on the material. 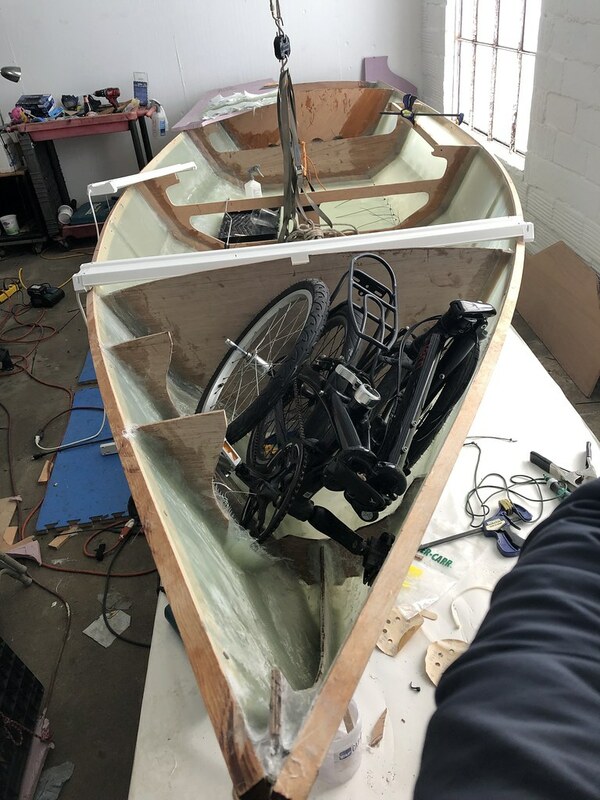 I am planning to make other changes to the boat that are also departures from the plans, including skipping Frame 1 to make possible a large accessible front compartment for my folding bike. 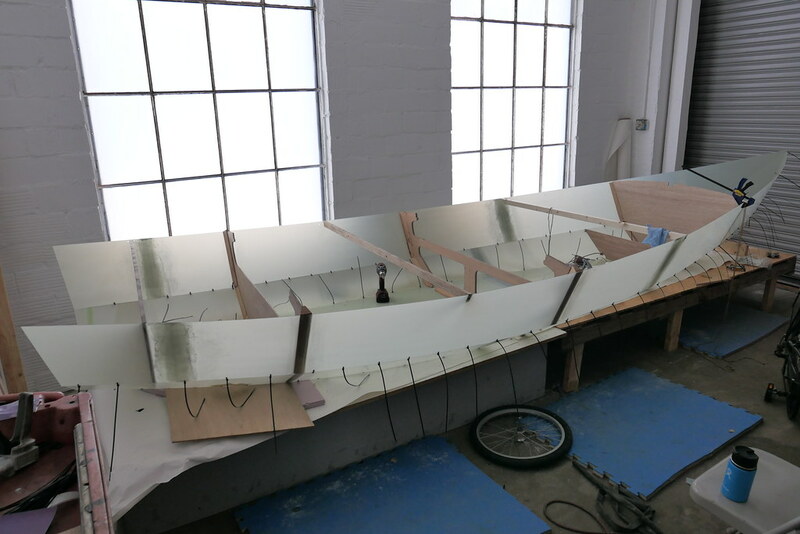 To compensate for not having Frame 1 and a sealed deck and king plank, all enhancing the structure of the bow, it will have a partial deck and waterproof structural hatch big enough for the bike, and multiple ring/web frames and ribs. Ross offered some input and recommended against doing it but understood the appeal! Look how the folding bike barely fits below the deck line, possible because my hull is scaled up 12%. At what stage are you going to glass the chines? With an open bow, you're going to get a decent amount of water in there if you sail into the wind in any sort of chop. On choppy days I often find myself stopping to bail a gallon or so out of the cockpit. The front deck see a lot of water that gets blocked by the coaming. I would be putting some limber holes in that forward bulkhead at the bottom chine on each side. Glassing the chines is the current chunk of work. 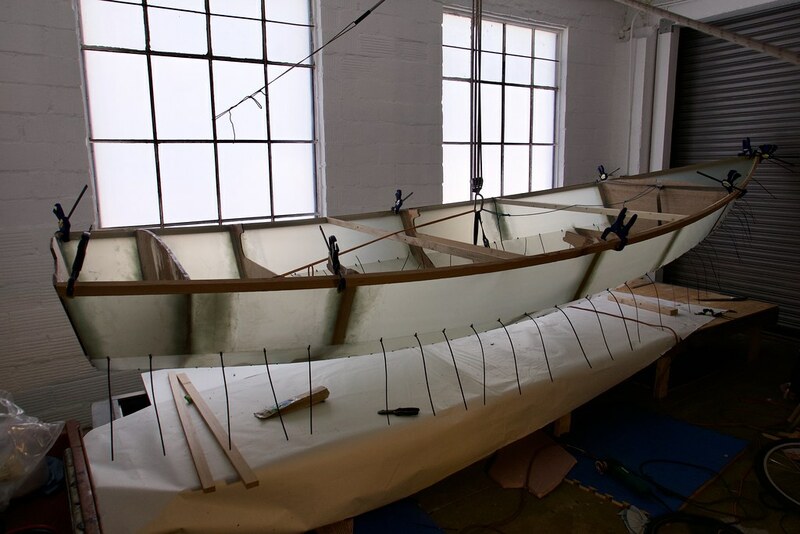 I jumped ahead to doing the gunwales because I didn't like how pokey the frames looked through the thin skin. 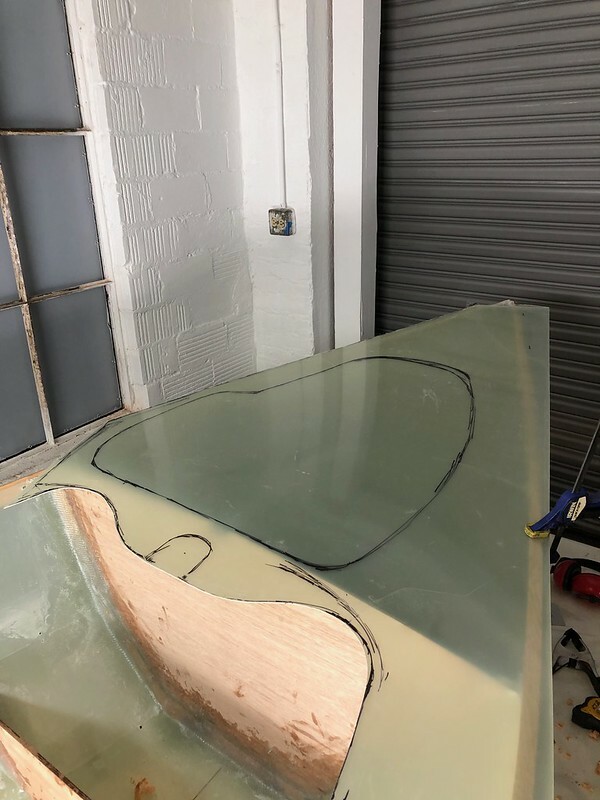 Now with the gunwales screwed in my assistant and I will glass the chines. Thanks for the heads up. I am planning to cover the front area with a large waterproof hatch cover that will also be structural. It will connect to the hull with bolts and T-Nuts sunk into a flange with a gasket; maybe a piano hinge on one side. I will try to design it so that it does some of what the king plank does in the plans. I don't want to lose the buoyancy of the front compartment and I don't want saltwater to bathe my folding bike! Progress on the first Mod is brisk! Weight is 135 pounds, still no centerboard, rudder, or deck. I am getting the sense that it's a heavier build, but it's also larger at 17'. To compensate for not using Frame 1 I am creating a series of smaller ribs that will turn the bow in a soccer ball. I went with the Plywood Stem shown in the plans, the diverged from there. The Kevlar patches are for where the folding bike will rub on the interior wall. There will be a partial permanent deck and a large waterproof and structural hatch. There will be additional ribs on the port side to compensate for a thinner deck there. Last edited by fossilfool; 03-27-2019 at 05:24 PM. Very interesting to watch this come together. Good call on making what amounts to a specific holder for the bike. Better to have a custom space than stuff it in a generic open space. Getting back to the flexibility of the material... I can now push on the long hull panels with my thumb, where the G10 is least supported, midway between frames and midway between the taped seams, and I see about a 1/8" - 1/4" deflection. I could bisect each panel the long way and put in a rib in to stiffen it, or leave it as is. I estimate that stiffening would add 10-15 pounds overall to my First Mod. How much does this type of this affect sailing performance? Would you recommend stiffening or leaving as is? In the bow area I'm stiffening. It seems like you want a very rigid shape where the boat meets the waves. I'm wondering whether to do the additional stiffening in the aft 2/3 of the boat. Last edited by fossilfool; 03-28-2019 at 01:21 PM. The bigger question is will the boat twist from the torque applied by the mast? A little flex in the panels isn't a big deal. 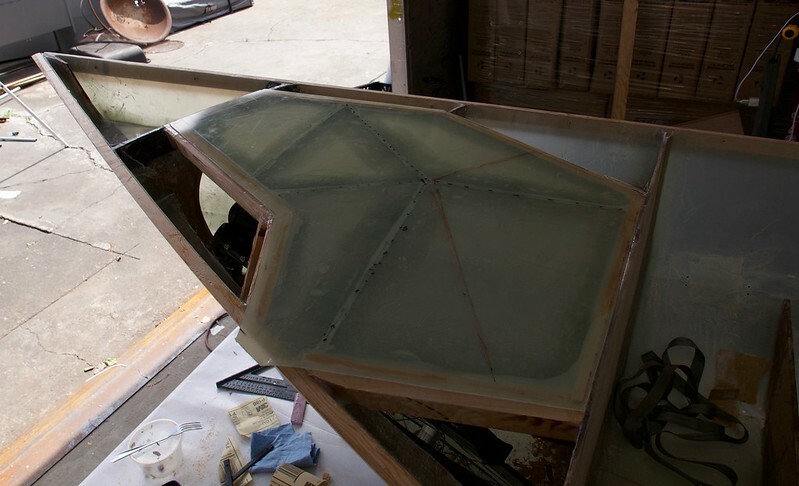 Here's the rough cut of the G10 forward deck showing where the access hatch to the bow buoyancy compartment will be. Note how it's not symmetrical; it matches the shape of the folding bike, which loads vertically and in only one orientation. 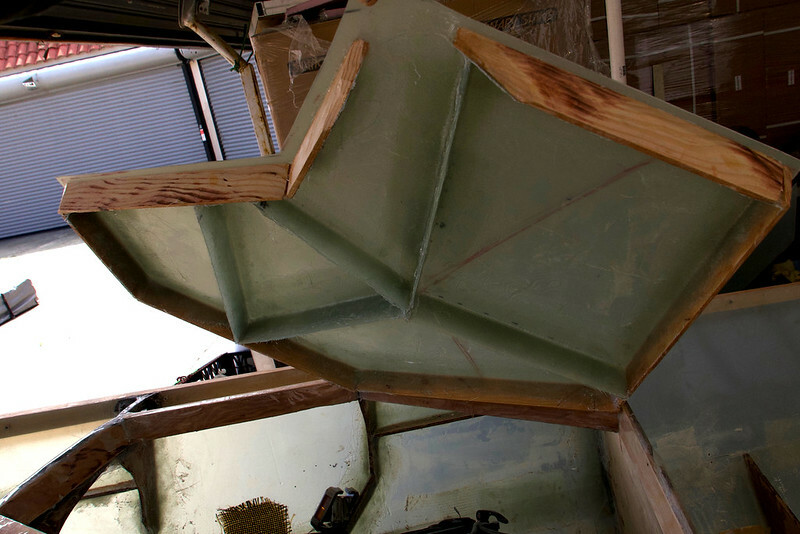 Overhang of bulkhead will allow for a strong connection to the mast step, and a fiberglass weld at the top curve of the bulkhead, giving an I Beam effect there which should help when it gets blowy. Custom waterproof structural bow hatch is now a thing! Red sharpie shows where a breakwater will go above the hatch. The breakwater will provide additional stiffness but the hatch is already pretty strong. I put most of my body weight on it today but it made some creaky sounds I didn't like. I decided to wait to try standing on it until the breakwater is in. I used plenty of G10 ribs on the underside. The ribs are nearly 2" tall and locked in fiberglass on both sides. 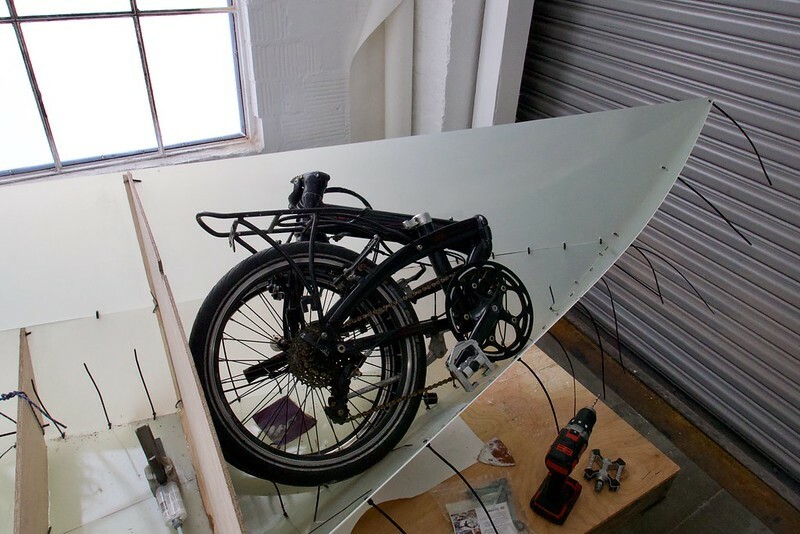 The exact placement of the ribs was designed to avoid contact with the folding bike underneath. Focus shifts to trailerizing the First Mod. Here's the first mockup. 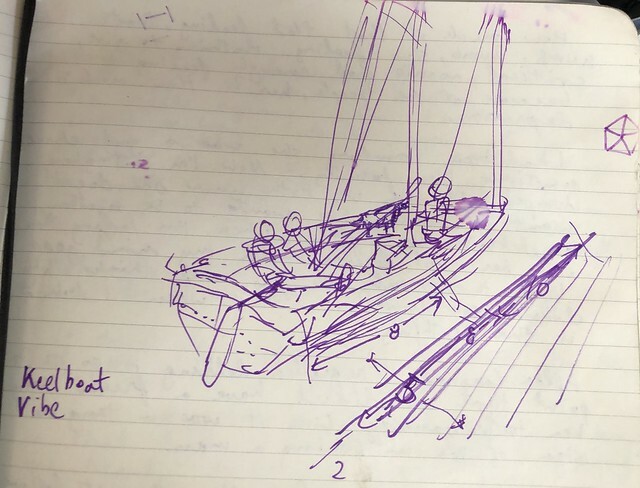 The concept here is a column support taking the load of the trailer to the gunwale, with some side twist resisting members at the chine, and then some type of cable under the boat (in tension). The goal is to be able to ride in the bike lane so narrower wheelbase is better. Last edited by fossilfool; 04-11-2019 at 02:00 AM.